To most brass players, the Chicago Symphony Orchestra brass section has no equal. Mark Ridenour fulfilled a dream by joining it as the appointed assistant principal trumpet in 1994; there had not been an opening in the trumpet section since 1978. Mark began his career with an appointment to the Lexington Philharmonic during his senior year of college. Positions in the Dayton Philharmonic, the Memphis Symphony, and the Florida Orchestra followed, as well as appearances with the New York Philharmonic, Cincinnati Symphony, Sarasota Opera, and Boston Symphony. He grew up on a farm in western Pennsylvania where trumpet playing was only a hobby, and his interests were on the running track and the baseball diamond. Upon arriving at Asbury College, playing trumpet became his passion and athletics became just a hobby. Though the venues of the past have changed, Mark enjoys the challenges of the golf course, tennis court, and ski slope. Since he has been with the CSO, Mark has enjoyed traveling with the Orchestra all over the world and takes every opportunity to play golf or tennis. His favorite courses include the Royal Waterloo Golf Club in Brussels, The Belfry, and the Luzerne Golf Club. Mark and his wife Linda have three great children: Michelle, Amanda, and Matthew. They enjoy playing together: soccer, tennis, cards, skiing, the piano, their brass instruments, ice skating at the park across the street. Linda has taught the children at home since they were school age. Both Mark and Linda are very active at the Salvation Army. Mark is the music director at the church and supervises the education of the young brass players. He also is an active member of the Salvation Army Advisory Council in Des Plaines. From the Chicago Symphony Orchestra website. Tage Larsen joined the Chicago Symphony Orchestra as Fourth/Utility Trumpet in 2002. He came from the Saint Louis Symphony Orchestra, where he served as Second Trumpet. Mr. Larsen was Principal Trumpet at the Annapolis Symphony Orchestra, and served as the Solo Cornet with the "President's Own" U.S. Marine Band. He received his Bachelor�s of Music degree from Michigan State University, and did graduate work at the Eastman School of Music. He studied with Barbara Butler, who presently teaches at Northwestern University. Mr. Larsen is a native of Cambridge, Massachusetts. He and his wife, Amy, are the parents of two young sons, Zachary and Ethan. John Hagstrom has been a member of the Chicago Symphony Orchestra's trumpet section since 1996, when he won the audition for fourth trumpet. A year later, he won the second trumpet position, carrying on the tradition of brass section teamwork for which the CSO is famous. Prior to joining the Orchestra, he was principal trumpet of the Wichita Symphony Orchestra in Kansas, and served as assistant professor of trumpet at Wichita State University. He currently leads the trumpet studio at DePaul University. A native Chicagoan, Hagstrom grew up listening to the CSO. Five years of study at the Eastman School of Music were followed by six years in "The President's Own" United States Marine Band in Washington, D.C., where he spent three of those years as principal trumpet. His many solo appearances with the band included four national concert tours and the Camp David wedding of (senior) President Bush's daughter, Dorothy. Player bio information taken from the DePaul University web site where Mr. Hagstrom is a faculty member. Craig Morris (Assistant Professor) is currently the Professor of Trumpet at the University of Miami, where he devotes himself to his teaching and his career as a soloist and chamber musician. Craig has been a prominent orchestral musician, most notably holding the prestigious post of Principal Trumpet in the Chicago Symphony Orchestra. He came to Chicago from the San Francisco Symphony where he held the position of Associate Principal for three years. Prior to joining the SFS, he was briefly a member of the Chicago Symphony Orchestra, performing as Fourth/Utility Trumpet in 1998. Craig has recorded extensively with both the San Francisco Symphony and the Chicago Symphony Orchestra, including the Grammy nominated recording of Furtwangler�s 2nd Symphony. He was also featured as principal trumpet on the SFS recordings: Copland the Populist, Charles Ives the American Journey, American Mavericks: Visionaries, Pioneers, Iconoclasts, and Aaron Copland: The Essence of America. Craig toured with both orchestras and enjoyed many performances in the world�s finest concert halls, including New York�s Carnegie Hall, Vienna�s Musikverein, Amsterdam�s Concertgebouw, Boston�s Symphnony Hall, London�s Royal Albert Hall, and Lucerne Switzerland�s Kultur & Kongresszentrum. Mr. Morris has also been a member of the Dallas Brass, an international touring brass quintet, and was Principal Trumpet of the Sacramento Symphony Orchestra, Opera and Ballet. He also performed with the band Metallica on their collaboration with the San Francisco Symphony, which was released on CD and video, and has been featured on MTV and VH1. Craig has a burgeoning solo career having been featured as soloist with the Chicago Symphony Orchestra, playing Bach�s Brandenburg Concerto No. 2 and Stravinsky�s L�Histoire du Soldat with Pinchas Zukermann in Orchestra Hall, and giving a repeat performance of the Brandenburg at the CSO�s summer home at the Ravinia Festival. Craig was also a featured soloist at Festival Miami, performing the world premier of the Concerto for Trumpet by composer Thom Sleeper, in October 2003. Other solo engagements include performances with the San Francisco Symphony, Sacramento Symphony Orchestra, Miami Bach Society, Northbrook Symphony, Highland Park Strings, Austin Handel-Haydn Society, Diablo Symphony Orchestra, and the San Francisco Old & New Music Ensemble. A Texas native, Mr. Morris was raised in a musical family. His late father, Cecil Morris, a band director and tuba player, was a major musical influence. Craig earned his Bachelor�s degree in music from the University of Texas, where he studied with Raymond Crisara. He continued his studies, earning his Master�s degree at the San Francisco Conservatory of Music in 1991, studying with Glenn Fischthal, Principal Trumpet of the San Francisco Symphony. After returning to Texas, Craig studied with Don Jacoby, a former Chicago freelance artist, and James Wilt, Associate Principal Trumpet of the Los Angeles Philharmonic. Player bio information taken from the University of Miami web site where Mr. Morris is the Assistant Professor of Trumpet. Adolph Herseth is one of a kind, a true master recognized For his brilliant musicianship by his colleagues and audiences the world over. "Quite possibly the most dazzling player on his instrument in the world today," noted the New York Times. And yet he has always found time to encourage and coach up and coming young brass players. In the summer of 1983 when he traveled to Sweden and Denmark, where he was named an honorary member of the Royal Danish Guild of Trumpeters, Mr. Herseth shared his expertise by giving a week long seminar and took time off to coach the brass sections of orchestras in Malm� and Gothenburg. The previous summer he participated in activities of the European Community Youth Orchestra. This emphasis on education probably stems from the fact that Mr. Herseth started out to become a teacher but gravitated to music as a career choice while he was in the armed forces. A native of Minnesota, he holds a degree From Luther College in Decorah, Iowa, and has taught at a number of universities. During World War II he served as a bandsman at Iowa pre_flight school and then the U.S. Navy School of Music. He ended his military service with the Commander of the Philippine Sea Frontier in the South Pacific. He was appointed principal trumpet of the Chicago Symphony Orchestra immediately after graduation from the New England Conservatory of Music in Boston. His Chicago years have included numerous solo appearances with the Orchestra and with Chicago Symphony brass ensembles. In addition, he has been active as a soloist with community and regional musical ensembles and orchestra throughout the country. Many of his performances can be heard on recordings prized by aficionados. He holds doctor of music (honoris causa) degrees From Luther College and the New England Conservatory of Music. Mr. Herseth is a charter member of the Symphonic Hall of Fame of the National Trumpet Symposium (Denver). He collects jazz records and cooks on occasion, "using every pot in the kitchen." He and his wife, Avis, are the parents of three children, and spending time with his grandchildren is one of his greatest pleasures. Other leisure interests include golf, travel, and French Impressionist paintings. From Wind Song Press Ltd.
Renold Otto Schilke, Sr., was born in Green Bay, Wisconsin on June 30, 1910, to a musical family. His father was a singer and his mother an organist, and Renold began studying cornet at age eight. He was a soloist with the Holton factory band, otherwise a band made up of adults, in 1921 at the age of eleven. Notwithstanding his actual age, he was billed at that time, vaudeville style, as a 7 year old "boy wonder" because of his small size. He told a former employee that as a youth he had the run of the Holton factory and observed the science and art of musical instrument design and manufacturing first hand. The old German workmen at the plant insisted that "if you play the instrument, you should know how to make it," and, with their help, Schilke made his first instrument at age 11. In addition to his interest in music, Schilke was also greatly interested in guns. He began working part-time at a Green Bay gun shop when he was 14 in 1924. The interest he had in machine work that was nurtured at the Holton factory, intensified here. By the time he was 17 he knew enough of tool and die making that he was able to make trumpet mouthpieces on the gun shop machinery and to make custom mouthpieces for brass instruments for others. In 1927, Schilke went to Brussels, Belgium, to study at the Brussels Conservatory. While there he became familiar with the work of Victor Mahillon, the 18th century Belgian acoustician and brass instrument designer, who Schilke attributed to having the greatest influence on Schilke's own design work. Mahillon's theories included the idea that one could control the intonation of brass instruments by making changes in the rate of taper in the in the tubing. Schilke claimed that such theories were mostly ignored by the other manufacturer of trumpets. In 1928, when Renold Schilke came to Chicago from Brussels to study trumpet with Edward Llewellyn, the principal trumpet player in the Chicago Symphony, he took a part time job working for a small mouthpiece maker in Chicago who made the mouthpiece that Llewellyn played. Schilke also played the same mouthpiece during his career with the Chicago Symphony. The current Schilke exterior is a variation of this mouthpiece. During the early 30's, Schilke earned a steady income by his playing and was able to take technical school courses in tool and die making. He also took courses in metallurgy and music at Northwestern University in Evanston and the University of Chicago. He and Llewellyn would often visit the Holton factory in Elkhorn, Wisconsin, during this time so that Holton could perform custom work on Llewellyn's instruments. Holton recognized Schilke's studies and expertise in the field even while in his younger 20's and they asked him to help solve tooling problems at the factory while providing him the opportunity to make and test his own design ideas using Holton facilities. His original design for the tuning bell trumpet was made during this time (around 1929) mostly as a way to switch bells easily while experimenting. Schilke was a member of the US Olympic team in 1932 and 1936 in pistol shooting. He continued his interest in guns and in competitive shooting till the end of his life. During the early 40's, to assist in the war effort, he worked as a civilian employee for Douglas Tool and Die, assisting in the development the M-1 rifle during the day and working as a symphony trumpet player at night. At Llewellyn's death in 1936, Schilke became a member of the Chicago Symphony Orchestra. It was at this time that he decided to supplement the income of Mrs. Llewellyn by manufacturing and selling the mouthpiece known as the E. B. Llewellyn Personal Model (which eventually became the Schilke 9) and he and Mrs. Llewellyn shared the income in some fashion from the sales. When Schilke started with the Chicago Symphony he became involved in trumpet design with Elden Benge who had been with the Symphony since 1932. The two were also neighbors and would carry on their experiments in Schilke's home workshop. When Benge became serious about manufacturing trumpets in 1938, Schilke did most of the tooling for the production and many in the industry attributed much of the success of Benge's instruments to Schilke's tool development. During this same time period, the late 1930s, Schilke was part of the Committee that designed the Martin Committee trumpet. The design influences are obvious in the reverse leadpipe, minimal bracing and lightweight materials. Schilke always felt that "he was the Committee" and took great pride in these instruments. Schilke's association with the Chicago Symphony began in 1937, and he served as principal trumpet from 1939 to 1941, succeeding Benge. His formal association with the Chicago Symphony ended in 1951, although he continued in an auxiliary role when needed through 1962. Schilke also continued to perform with the Chicago Symphony Brass Ensemble, a brass quintet, throughout the 50's. They recorded, gave recitals, clinics and instrument demonstrations sponsored by Holton. Adolph Herseth played first trumpet, Schilke second. Schilke also performed with the Grant Park Symphony and the WGN Radio Orchestra. He remained active as a performer as a member of the Chicago Lyric Opera Orchestra from 1954 until 1964. He was also featured in a print advertisement for Scott Radios. The Chicago Symphony Orchestra is pleased to announce that Christopher Martin has been appointed to the position of Principal Trumpet. Mr. Martin comes to the CSO from the Atlanta Symphony Orchestra, where he has served as Principal Trumpet since 2001. Before joining the Atlanta Symphony, Mr. Martin was Associate Principal Trumpet of the Philadelphia Orchestra. The 29-year-old trumpeter has been an affiliate trumpet professor at Emory University in Atlanta and Temple University in Philadelphia, and has given master classes at conservatories and colleges throughout the United States, including at the Manhattan School of Music. He has performed as Principal Trumpet with the Los Angeles Philharmonic, the Seattle Symphony, and the Grand Teton Music Festival. Mr. Martin, a native of Marietta, Georgia, comes from a musical family. His father, Freddy Martin, is a band director for a prestigious Georgia private school, and his mother, Lynda Martin, sings in the Atlanta Symphony Chorus. While a member of the Atlanta Symphony Youth Orchestra, Mr. Martin trained with then-Atlanta Symphony Orchestra trumpeter Larry Black. He later received his bachelor's degree in trumpet performance in 1997 from the Eastman School of Music in Rochester, New York, where his primary teachers were Charles Geyer and Barbara Butler. As Principal Trumpet of the Atlanta Symphony Orchestra, he can be heard on a number of recent recordings, including the ASO's 2003 Grammy Award-winning recording of Ralph Vaughan Williams' A Sea Symphony conducted by Robert Spano. Elden Benge was only 7 years old when he first fell in love with the trumpet - a love that would turn into a life-long affair for the Winterset, Iowa native. It was also then that he adopted his first hero, the trumpeter of the hometown band. Young Elden persuaded his family to buy a trumpet for him, and he practiced religiously. He began playing professionally when he was 14 and, years later, assumed the role of First Trumpet with major symphony orchestras in Detroit and Chicago. As a gifted musician, Benge became increasingly dissatisfied with the range of tone available in ordinary mass-produced trumpets. He studied the technical and mechanical aspects of the trumpet in search of ways to improve its playing characteristics. Working with two craftsmen skilled in the construction of the trumpet, Benge began to fashion trumpets in the basement of his home. Through tireless experimentation, he finally developed his "dream trumpet" . . . an instrument with remarkable clarity, tonal range and easy response. Success was due to a combination of specially designed tapers, extremely precise machining tolerances, and special alloys. But the secret ingredient was meticulous attention to detail. In 1939 Benge sold his first custom-made trumpet to a fellow trumpeter in the Chicago Symphony. News of the marvelous Benge trumpet spread among professional players and what had begun as an artistic endeavor was soon a thriving business. Top trumpet players everywhere began to call on Benge to solve their performing problems. By 1952, the demand for the trumpet was so great that Benge retired from active performing so that he could devote all of his energies to his goal of producing the world's finest trumpets. Benge's instruments defined a new level of performance and quickly became the benchmark by which all others were judged. Designed to satisfy a variety of musical performance styles, Benge trumpets, cornets and trombones continue to meet the ever-changing needs of today's artists. Such a desirable reputation is possible today through strict adherence to the same attention to detail set forth by Benge in his basement some 60 years ago. Benge upholds this tradition of fine craftsmanship and perfection to create instruments of timeless quality. Dude, these guys are/were at the top of the trumpet world... how cool is that? A seat in the CSO is priceless IMO. For more than a half-century, Adolph Herseth�s distinctive sound and playing style were the bulwark of a brass section whose fabled power and brilliance have long been the sonic hallmark of the Chicago Symphony Orchestra. He was a legend, in the finest sense of that much-abused word. Herseth, whose 53 years as principal trumpet of the CSO remain unequalled in orchestral history, died Saturday at the Oak Park home he and his family have lived in from the time he joined the orchestra in 1948. The cause of death was not disclosed. He was 91. Herseth played under five CSO music directors, from Rafael Kubelik through Daniel Barenboim. He stepped down as first trumpet in 2001 and served as principal trumpet emeritus from 2001 until his retirement in 2004. The musician everybody knew, simply, as �Bud� Herseth was instantly recognizable at the center of the CSO�s fabled brass section. He was the man whose face would turn radish-red when he was scaling the trumpet stratosphere or tossing off a rapid scale passage. Where he found the huge volume of air needed to make a notoriously recalcitrant brass instrument soar like that, Herseth wasn�t saying. That was part of the Bud Mystique. Most brass players suffer a weakening of the embouchure � or �lip,� as they call it � as they grow older. Herseth�s lip only seemed to get stronger over time. Orchestral colleagues and music directors alike stood in awe of him, not only for his long-running technical prowess but also for his deep musicality and dedication to helping the CSO maintain the highest possible musical standards. �Every great orchestra depends on a few pillars to support it and help make it what it is. Bud has been for the Chicago Symphony one of those pillars,� said Daniel Barenboim in 1995 when Herseth was about to begin his 48th season with the orchestra. Herseth actually was hired into the CSO by Kubelik�s predecessor, Artur Rodzinski, in 1947, when �a totally green kid of 26,� as Herseth once described himself, was swept from nowhere to the first chair of the Chicago trumpet section. He formally entered the ranks in 1948 following Rodzinski�s single stormy season as the orchestra�s musical chief. Building a strong corporate identity for the CSO brass choir was important to Herseth from the early decades of his tenure. And he set the bar very high indeed for the other superb brass players, many of them Herseth disciples, who entered the orchestra after him � including Dale Clevenger, who recently announced he will step down as principal horn at the end of the 2013 Ravinia season, and Jay Friedman, who joined the orchestra in 1962 and is still going strong as principal trombone. Long a senior musical executive of the CSO, Herseth contributed in many ways to making �the Chicago brass� synonymous with impeccable musicianship and style, along with a big, molten sound. He prompted the CSO to adopt the use of four identical trumpets (Vincent Bach large-bore C trumpets, to be exact), which resulted in a homogeneity of sound the CSO had not known before. As of 1965, he also had the orchestra acquire a set of rotary valve trumpets whose timbre make them especially suitable for late 19th and early 20th century German and Austrian music. Although Herseth logged well over 50 solo appearances with the Chicago Symphony, he always thought of himself as a symphony musician, not as a solo player. Indeed, he often said that performing concertos did not come close to matching the musical satisfaction he got from playing a Mahler symphony with 80 or so orchestral colleagues. Born in Lake Park, Minn., Herseth was the son of a band director who gave him his first trumpet. Young Bud got his start playing trumpet and cornet in school bands and at music camps. He graduated from Luther College in Iowa with a degree in math before playing with various service bands during World War II. In the late 1940s he studied with Marcel Lafosse and Georges Mager at the New England Conservatory in Boston, hoping to land a high school or college teaching job. At the conservatory, word of his talent got around. One day he received a telegram saying that Rodzinski, the famously temperamental conductor who had just been named CSO music director, wanted him to come to New York to play for him. �I didn't know much of the orchestral repertory at that time, so I checked out the trumpet parts for as much music as I could find in the libraries,� Herseth later recalled. �Then I went down to Rodzinski's apartment on Fifth Avenue and dumped the music on the rack of his grand piano in his enormous living room. I wasn't nervous, because I thought I was auditioning for the third-trumpet position. �So you can imagine my surprise when, after listening to me for about an hour, he said, �You will be the new first trumpet of the Chicago Symphony.� I just figured that if I could get a job as second, third or fourth chair with any decent orchestra, I'd be happy! Herseth�s mighty trumpet shines through in numerous CSO recordings. Indeed, he plays the solo �Promenade� on all six recordings the orchestra has made of the Mussorgsky-Ravel �Pictures at an Exhibition,� under Kubelik, Fritz Reiner, Seiji Ozawa, Carlo Maria Giulini, Georg Solti and Neeme Jarvi. Not bad for a �green kid� from Lake Park, Minn. Survivors include Herseth's wife, Avis, and a son, Stephen. The family has advised that services will be private. A memorial service and an open house to celebrate Herseth�s life are being planned. Adolph Herseth, the principal trumpeter of the Chicago Symphony Orchestra for 53 years and one of the most accomplished and influential orchestral trumpeters of his time, died on April 13 at his home in Oak Park, Ill. He was 91. His death was confirmed by his wife, Avis. 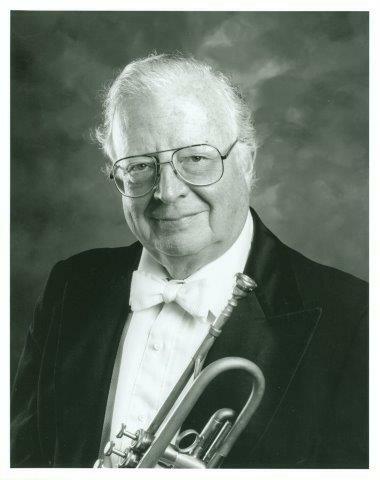 Mr. Herseth was the symphony�s principal trumpet from 1948 to 2001, a stretch roughly double the average career span for elite instrumentalists and coinciding with the orchestra�s rise to the top ranks. Under Georg Solti and four other conductors he defined the orchestra�s distinctive brass sonority. The sparkling virtuosity of his playing � and the way his cheeks flushed beet-red when he played staccato high notes � made Mr. Herseth something of a celebrity among classical music audiences in Chicago. Autograph seekers often mobbed him at the stage door of Orchestra Hall, a trumpet player or two usually among them asking to study at his feet. But outside Chicago he was considered a buried treasure. Describing Mr. Herseth as �quite possibly the most dazzling player on his instrument in the world today,� Donal Henahan of The New York Times lamented his relative obscurity, attributing it largely to the paucity of great music for orchestral trumpet. �If Beethoven, Brahms and Mozart had left a repertory of trumpet concertos, Mr. Herseth might be as familiar to the world as Heifetz, Horowitz or Rostropovich,� Mr. Henahan wrote. By his own account, Mr. Herseth, a genial, plain-spoken native of rural Minnesota, did not seek wider fame, saying he found more pleasure in collective music-making than in solo playing. For his 50th anniversary with the symphony, in 1998, Mr. Herseth resisted plans for a gala event that would have put him in the spotlight � �tooting my own horn,� in his words. Instead, he invited a large contingent of colleagues, former students and old friends, including the trumpet player and former �Tonight Show� band leader Doc Severinsen, to join in the concert. Adolph Sylvester Herseth was born on July 25, 1921, to Cora and Adolph Herseth in Lake Park, a town of only several hundred people in northern Minnesota�s lake country. His father was a schoolteacher, school administrator and director of a children�s orchestra. Avis and Adolph, who was known as Bud, were married in 1943. In addition to his wife � �the only girl I ever dated,� he told an interviewer � Mr. Herseth is survived by a daughter, Christine Hoefer; a son, Stephen; six grandchildren; five great-grandchildren; and a brother, John. Mr. Herseth graduated from Luther College in Decorah, Iowa, intending to become a music teacher. But after serving in the Navy during World War II and playing trumpet in military bands, he decided on a career as a performer. In 1948 he was working on a master�s degree at the New England Conservatory of Music in Boston when he received a telegram from Artur Rodzinski, the Chicago Symphony�s music director, summoning him to an audition. Someone at the conservatory must have recommended him, Mr. Herseth said later. He never learned who. The audition was a stunning success. To Mr. Herseth�s surprise, Mr. Rodzinski announced immediately afterward that Mr. Herseth, then 26, would be the new first trumpet. After giving up his post in 2001, Mr. Herseth held the title of first trumpet emeritus until 2004, when he officially retired. John Hagstrom, who sat next to Mr. Herseth for several years as second trumpet, recalled a story about a conductor who seemed unnerved by Mr. Herseth�s red-faced appearance during the most taxing trumpet passages. �Mr. Herseth, maybe put on some powder,� the conductor suggested. Mr. Herseth demurred, he told Mr. Hagstrom. �It shows people I�m trying,� he said.